Using google forms is proving to be a quick and easy way of getting feedback from students who use our Edinburgh campus library. We have already been using them for recording quick, easily resolvable enquiries at the library service desk so decided to try them out last year for feedback. What is the purpose of your visit to the library today? How long do you intend to stay in the library today? If more facilities could be added to the library, which 3 are the most important? There were a selection of options to choose from for questions 1 and 3. The questions were printed out and handed to students to fill in at the library service desk. 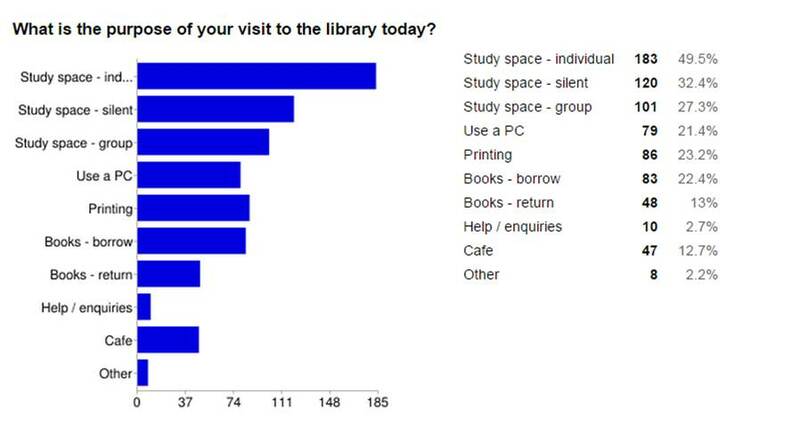 We had 513 responses and the feedback helped to inform developments in the library last summer including the installation of new group study spaces that have proven very popular with students. Although the forms were printed out the responses were entered by staff into the google form online and this made it very easy to collate the responses and produce a summary. This year, at the same time of year, we produced an updated form to collect feedback based again on the purpose of visits to the library. The questions were similar in that question 1 and 2 were the same and question 3 was ‘If more study spaces could be added to the library for next semester, which 3 are the most important’? Respondents could select more than one response. Copies of the form were printed out and distributed at the Library service desk as before. Also in order to promote the form, a link to it was posted on the Information Services Facebook page and twitter feed. This resulted in quite a few online responses – of the total 373 responses, 291 paper and 82 electronic. The responses were input into the google form which automatically populates a spreadsheet of results. The other useful feature of a google form is that it automatically produces a summary of results in an easy to read format. The results show a preference for individual study spaces which is a reflection of the time of year leading up to revision but also reflects the room usage figures that we collect. Preferences for future developments show a demand for individual study spaces and in fact more study spaces of all kinds. Students selected more than one type of study space that they would like to see in the future.